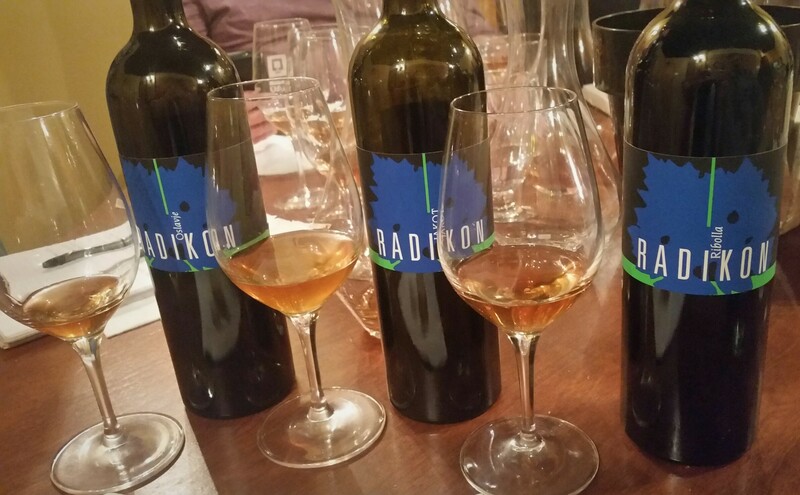 The Mo’ Wine Group have been fans of Radikon’s “blue label” orange wines since discovering the Oslavje when it was a private import. All three wines are now carried by the SAQ, albeit in minute and fast-disappearing quantities. This year, though the 2010s were released on different dates, all three were on the monopoly’s shelves for a few days in late February or early March, giving us our first opportunity to taste them side by side. The wine-making is the same for all three cuvées. The manually harvested grapes are destemmed, then placed in neutral Slavonian oak vats (no temperature control) for maceration and fermentation with indigenous yeasts and manual punch-downs three or four times a day. When alcoholic fermentation is complete, the vats are topped up and closed until the wine has been in contact with the skins for two to three months. The grapes are then gently pressed and the wine is racked into neutral 25- to 35-hectolitre Slavonian oak barrels for about 40 months’ maturation, with further racking performed as needed. The wines are bottled unfiltered, unfined and with no added sulphur and aged another six months in bottle before release. The bottles are 500 ml because the late Stanko Radkion felt that is the ideal amount of wine for one person to drink by himself or for two people to share, assuming they’ll also share a 500 ml bottle of red. Convinced that using a standard cork would allow too high a rate of oxygen exchange, he designed his bottles to have smaller bore necks and long, narrow corks. Long corks usually indicate that a wine is age-worthy and, in fact, the ageing potential of these wines is not in doubt: opened last year, a bottle of the 2002 seemed at or near peak and likely to remain so for another 10 years. 100% Friulano (formerly known as Tocai Friulano, as referenced by the cuvée’s name, which is Tokaj – the Hungarian spelling – spelled backwards) from organically farmed vines. 13.75% ABV. Quebec agent: oenopole. A blend of Chardonnay (40%), Sauvignon Blanc (30%) and Pinot Grigio (30%) from organically farmed vines. Quebec agent: oenopole. 100% Ribolla Gialla from organically farmed vines. 13.75% ABV. Quebec agent: oenopole. 100% Riesling from organically farmed 20-year-old vines rooted in sandstone. Manually harvested. Macerated 24 hours on the skins. Clarified through sedimentation. Fermented (with selected yeasts) for two weeks and matured for six months in stainless steel tanks. Malolactic fermentation was prevented. Filtered but not fined. Screwcapped. Residual sugar: 3.1 g/l. 11% ABV. Quebec agent: Valmonti. 100% Riesling from 25-year-old organically farmed vines rooted in red slate. Manually harvested. Macerated 24 hours on the skins. Clarified through sedimentation. Fermentation with selected yeasts lasted four weeks. Matured six months in stainless steel tanks. Malolactic fermentation was prevented. Filtered but not fined. Residual sugar: 1.3 g/l. 12.5% ABV. Quebec agent: Valmonti. The estate’s top wine. 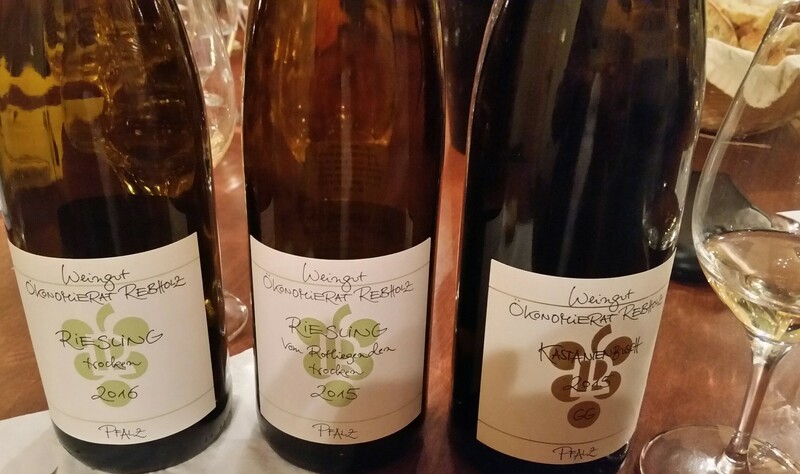 Großes Gewächs (“great growth”) is an unofficial designation for top-level dry wines from selected sites that is increasingly used in the Mosel by the members of the Bernkasteler Ring and elsewhere (except the Rheingau) by the members of the VDP growers’ association. This 100% Riesling comes from 50-year-old organically and biodynamically farmed vines in the Kastanienbusch vineyard (the name refers to chestnut trees that grow nearby). The soil consists of loose deposits of granite, slate and melaphyre with a high iron content giving it a dark red colour. The manually harvested grapes were destemmed and then macerated on the skins for 24 hours. The must was clarified through settling. Fermentation (with selected yeasts) and maturation in stainless steel tanks lasted about seven months. Malolactic fermentation was prevented. Filtered but not fined. Bottled in May 2017. Residual sugar: 4.8 g/l. 12.5% ABV. Quebec agent: Valmonti. In case you’re wondering, Ökonomierat is a German title of honour conferred upon individuals and organizations in recognition of their outstanding service to agriculture. 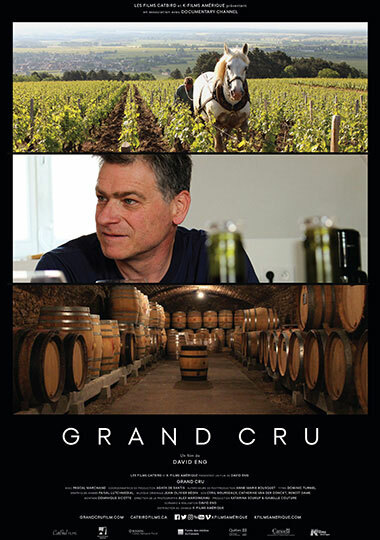 Written and directed by MWG member David Eng, Grand Cru is a documentary film whose subject is winemaker Pascal Marchand. Pascal Marchand, an aspiring poet from Montreal, arrived in the mythical land of Burgundy to work the harvest at age 21. Enchanted by the region, he settled there and embarked on an unlikely path to winemaking stardom. Now over 30 years later, he is renowned as an artist and innovator, finding his inspiration in the ancient techniques of the Cistercian monks who meticulously studied and refined Burgundy’s winemaking in the middle ages. Shot over his most difficult year ever, the catastrophic 2016 season which saw devastating frosts, hailstorms and disease in the vineyards, the film is both a love letter and a cautionary tale, as winemakers like Pascal must face the unpredictable and destructive consequences of climate change. Grand Cru begins its Montreal theatrical run at Cinéma Beaubien this Friday, April 6, at 12:35 p.m., 5:15 p.m., and 7:15 p.m. David and Katarina Soukup, the film’s producer, will be present for a Q&A session after the 7:15 screening. The run continues through Wednesday, April 11, with screenings every day at 12:35 p.m., 5:45 p.m. and 9:25 p.m. The film will also be shown at Cinéma Le Clap in Quebec City on April 6 (9:45 a.m. and 6 p.m.) as well as on April 21 and May 4 and 21. Further screenings are slated for Newport Beach (April 30 and May 3) and Toronto (May 11), the last with David and Katarina leading another Q&A (see the Grand Cru website for details). In March, I attended an advance screening at the ITHQ. Besides the pleasure of meeting Pascal and watching the worthwhile film, we were provided with glasses of three wines from the Marchand-Tawse portfolio. You’ll find notes on them and a comment or two from Pascal after the jump. Located in Monforte d’Alba, the approximately seven-hectare Cascina Disa estate has been in the Sandri family since 1965, the year of current owner/winemaker Elio Sandri’s birth. Elio has been in charge since 2000 and his is the only name now shown on the wines’ front labels. 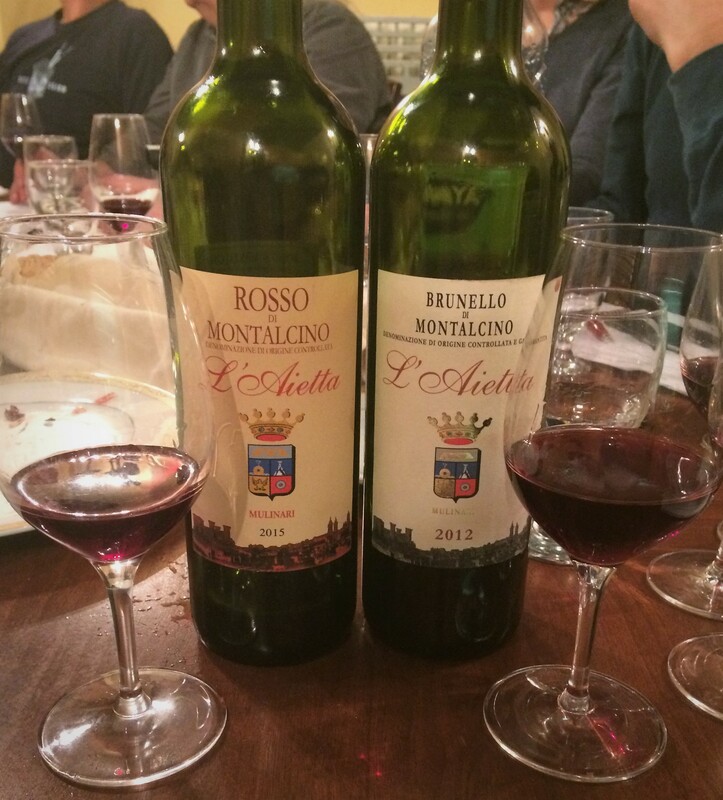 Only six wines – all red and resolutely traditional in style – are made: Dolcetto d’Alba, Barbera d’Alba, Langhe Nebbiolo, Marapika (a Langhe blend of the three varieties), Barolo and Barolo Riserva. The farming is organic but uncertified. Pruning is about the only intervention in the vineyard. 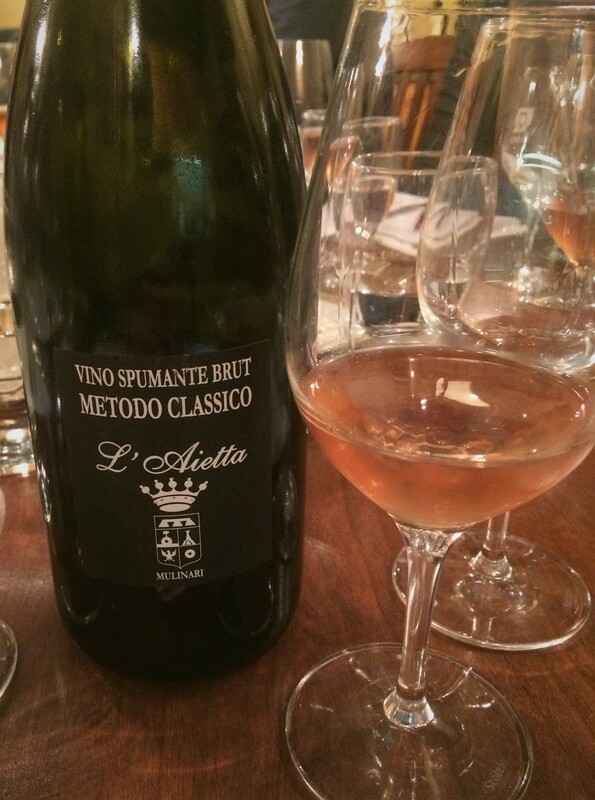 The wine-making is similarly non-interventionist: spontaneous fermentation, minimal manipulation, extended maturation in neutral botti and no filtering or fining. The only addition is tiny amounts of sulphur dioxide at bottling. Sandri is sometimes ranked alongside Bartolo Mascarello and Rinaldi; to go by our tasting, it’s easy to see why. A blend of Barbera and Dolcetto, in equal proportion, with a small dollop of Nebbiolo from younger vines planted on north- and east-facing slopes. 12.5% ABV. Quebec agent: Labelle Bouteille/oenopole. 100% Dolcetto from vines planted in 1977. Vinified in cement tanks. 13% ABV. Quebec agent: Labelle Bouteille/oenopole. 100% Barbera from vines rooted in ferrous sandstone and planted in 1945 and 1976. Manually harvested. Partially destemmed. Matured eight months in very old Slovenian oak botti, six months in the bottle. 14.5% ABV. Quebec agent: Labelle Bouteille/oenopole. 100% Nebbiolo from vines planted in 1937. Macerated, with a submerged cap, for 28 days. Matured six years in neutral Slavonian oak botti. Total production: 3,500 bottles. 14% ABV. Quebec agent: Labelle Bouteille/oenopole. For background on the Avise-based estate, see here. 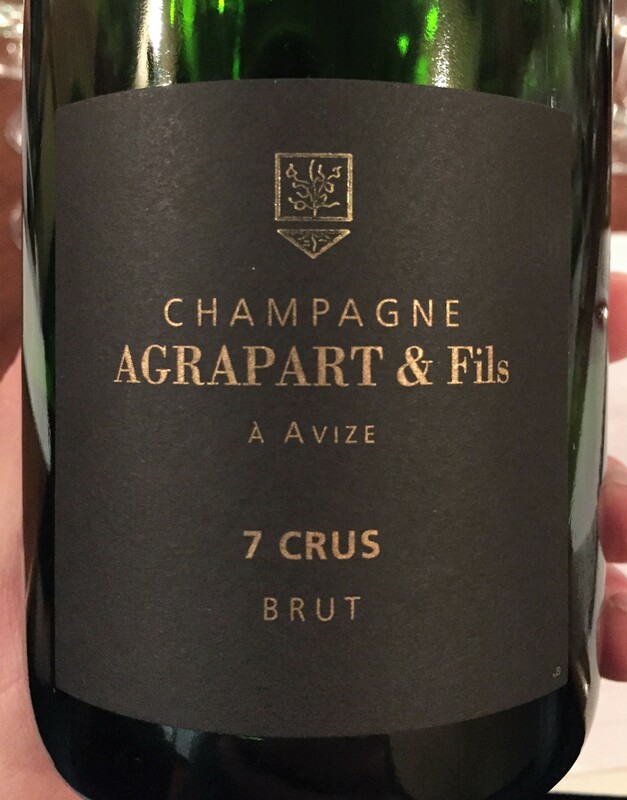 A blend of Chardonnay (90%) and Pinot Noir (10%) from two vintages (40% 2012 and 60% 2013 per the Agrapart website). The grapes came from vineyards in seven villages. After alcoholic fermentation, the still wine underwent malolactic fermentation. Half of the 2012 wine was matured in oak barrels. Bottled unfiltered and unfined in May 2014. Matured in bottle on the lees for three years. Riddled manually. Disgorged on an as-needed basis 60 days before being released to market. Dosage was limited to 7 g/l of sugar and 50 g/l of sulphur dioxide. 12% ABV. Quebec agent: Bella Vita. This is nearly all 2014 except for a dollop (about 5%) of reserve wine from a solera-type system started in 2001. A blanc de noirs: 100% Pinot Noir from 30-year-old biodynamically farmed vines from several parcels but all rooted in Kimmeridgian marl. The manually harvested grapes are gently pressed. The free-run juice is transferred to 400-litre oak casks for fermentation (with indigenous yeasts) and maturation. Undergoes malolactic fermentation. Indigenous yeasts are used for primary and secondary fermentation. Matured 10 months in used Meursault barrels. The bottled wine is aged on its lees on lattes and riddled on racks for around 15 months. No dosage. Sulphur dioxide is added to the incoming grapes but not at bottling. 12% ABV. Quebec agent: Rézin. A blanc de blancs: 100% Chardonnay from biodyanmically farmed vines planted in 2000 in a single plot. The vines – massale cuttings from Jacques Sélosse and Vincent Dauvissat – were planted “wild” (directly in the unprepared clay and Kimmeridgian limestone soil). Manually harvested. Fermented and sparkled with indigenous yeasts. The still wine is matured 18 months on the lees in oak casks. Undosed. 12% ABV. Quebec agent: Rézin. 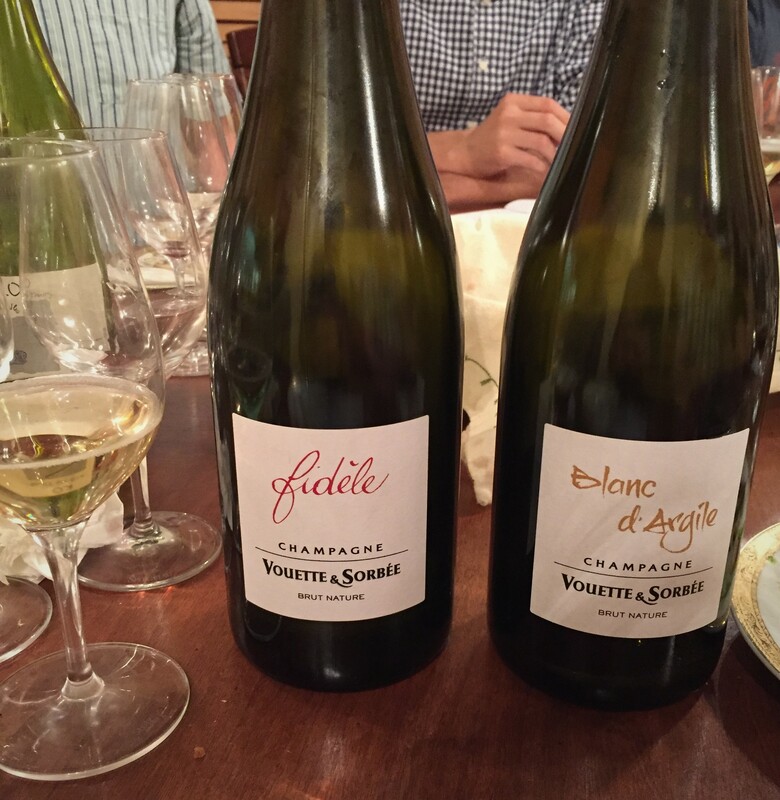 The first time I tasted them, Vouette et Sorbée’s champagnes did not impress. Subsequent encounters, which have mostly involved bottles laid down a few years, have been much more positive and I now rank the house among my favourite producers.